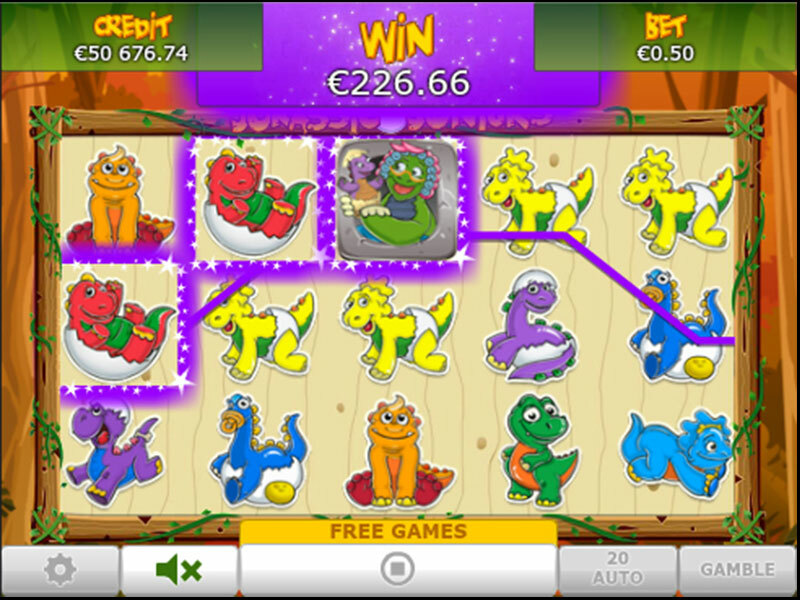 This cutely designed slots game from Eyecon features around some loveable baby dinosaurs. Befriend these playful animals and embark on an adventure through the Jurassic world in search of free games, scatter bonuses and financial rewards. Eyecon have really proved themselves worthy of their place in the lead of the online slot industry after 20 years of dedication to developing top quality slot games with superior graphics and enthralling themes. They pride themselves on originality and simplicity, making your experience as satisfying and worriless as it can get. Jurassic Juniors is one of their cutest slot games so far, taking you back to a time when dinosaurs were alive, but not the scary kind, rather the adorable baby kind. Take a trip to the past, when humans didn’t yet exist and the planet was covered in thick vegetation. Watch out, for in these prehistoric times, dinosaurs ruled the earth. You imagined huge, scary creatures, didn’t you? Well, surprise, in Jurassic Juniors, dinosaurs are rather adorable. They will charm you with their big cartoony eyes and cute friendly faces. What’s more, they’re prepared to give you big bonuses and help you win grand prizes. Who would’ve thought hanging out with baby dinosaurs could be so rewarding? This slot game has its 5 reels filled with cute and huggable little dinosaurs that you’ll be ecstatic to play with, in the pleasing jungle background. The reels are placed in a wooden frame and the buttons are carved in stone for more authenticity, while the overall feel is very playful. Do not be fooled by that, however, as great and grown-up prizes await you. There is a maximum of 25 lines whose number you can adjust according to your preferences, and the betting start at 0.01 credits and goes up to 0.50 credits. You’ll want to make the most of Jurassic Juniors, though, as big Bonuses are waiting to be revealed. All the icons consist of different species of junior dinosaurs, in a variety of colours, in or out of their eggshell, and you can be sure you’ll find a favourite that you’d like to take home. Winning is quite easy, especially with so many paylines, and to make things interesting, you can always play double or nothing by clicking on the gamble button and choosing one of the two adorable creatures. The Nurturing Dinosaur Mother icon is the Wild of this slot game and it can substitute any other icon except the Scatters, in order to form more winning lines, also doubling your prizes. Dinosaur mums are just as generous as regular mums! The Scatter in Jurassic Juniors is the egg icon, and by spinning 3 or more of them anywhere on the reel, you’ll get not only 15 Free Games, but also 3 times your initial win! So wait no more, as this 5-reel slot game will delight you with its simplicity and cuteness overload, while you keep collecting prizes. 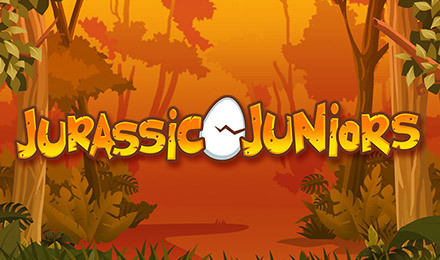 Jurassic Juniors was developed with great care and attention to detail, which can be seen both in the design and the gameplay. There are few things more enjoyable than spinning baby dinosaurs, and you’ll discover the pleasure of it through this slots game, so long as you’re a fan of cute little creatures. Also check out our Age of Discovery slot.